Location: The Parade begins at 77th Street & Central Park West at 9am. The Parade will march south on Central Park West. At Columbus Circle, the Parade will then turn EAST onto Central Park South instead of heading down Broadway. When the Parade reaches 6th Avenue, it turns south to 34th Street. At 34th Street it heads west to Macy's Herald Square and ends at 34th Street and Seventh Avenue at around noon. Admission: Free. There are no tickets available to the general public for seating. However, a select number of seats are available to charitable organizations (you must be a 501C3) to auction off at fundraisers. 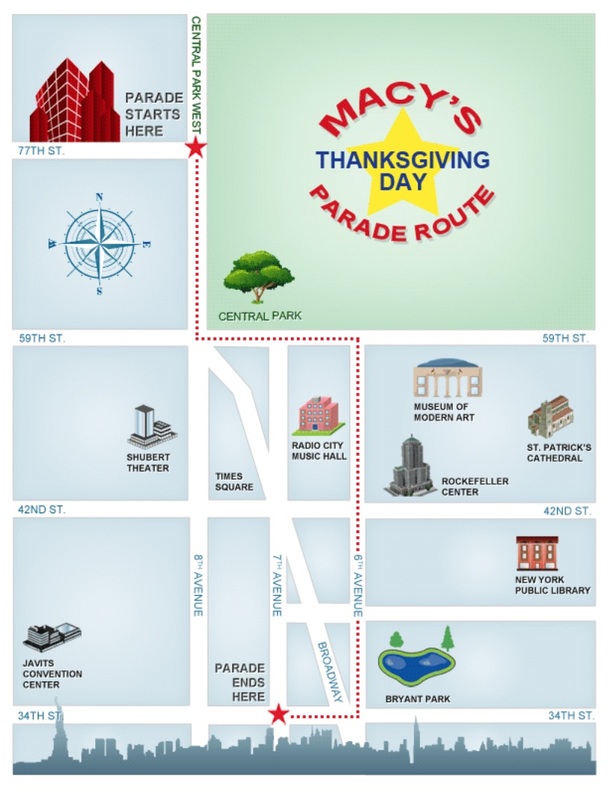 For more information contact the parade directly at paradequestions@macys.com. Spectators with special needs can call Healing Arts Initiative at 212-284-4100.